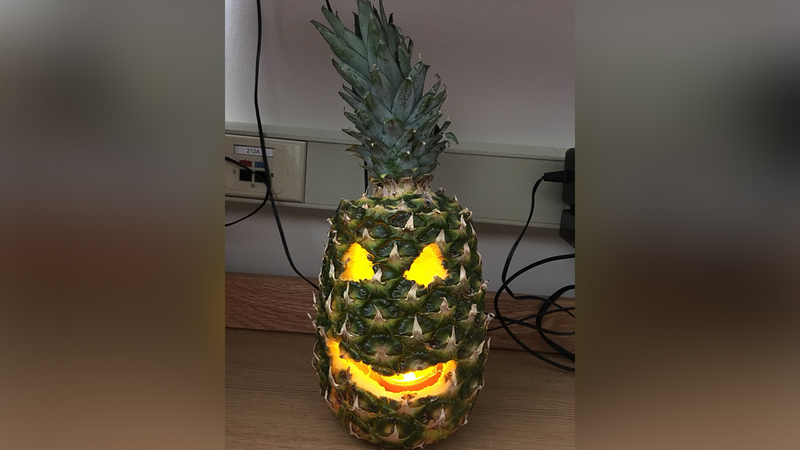 ARKON, Ohio -- A student at the University of Akron (UA) was displeased when he learned that there was a ban on "Halloween pumpkins" in his dorm; however, that didn't stop him from celebrating in a creative way - by carving a pineapple instead. On Friday, freshman Alex Schwarz tweeted about is creative loophole saying, "So there's a rule against pumpkins in my dorm but it doesn't say anything about pineapples." Why a pineapple? Well, the food and environmental nutrition major told ABC11, "It just felt right honestly, and it was definitely was the funniest option." But joy from the pineapple was short lived because Schwarz said his RA found the makeshift jack-o-lantern and threw it away, leaving a note that read, "Gone." In retaliation, the student carved an army of miniature apple jack-o-lanterns and lined them up in the hall, announcing that he was ready for "war." But UA said it doesn't hate pumpkins, in fact, its Culinary Artist's Club held a pumpkin carving contest days before Schwarz's creation was removed from his dorm. University officials said they do not allow Halloween-inspired carved fruit - of any kind - because they can rot and attract bugs or rodents. While Twitter users are waiting for the RA's next move, many said they've been inspired by Schwarz's story and have started carving all kinds of fruit. Schwarz said if his army of apples goes missing too, his next course of action will be to use a cantaloupe, bell pepper, or a head of lettuce.